Another look back into the archives. 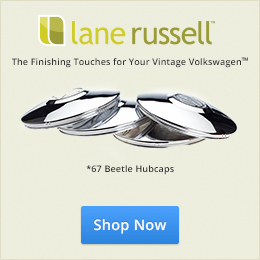 There are so many great stories shared at 1967beetle.com about the one and only ’67 Beetle. Kevin’s car is a fantastic example. Hello, my name is Kevin Gabor. 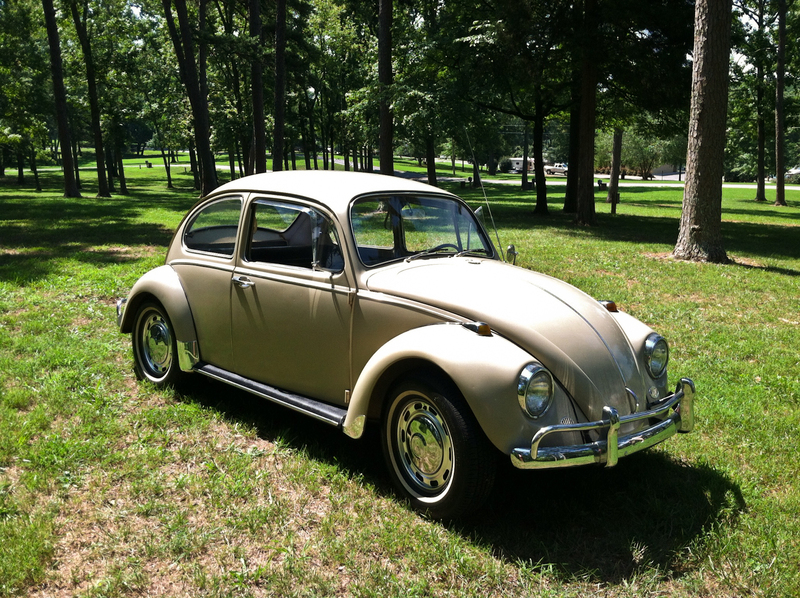 The story of the ’67 beetle that I now own goes back to my high school years. When I was 17 starting my senior year, my Dad let me “co-own” his green ’71 VW beetle. For my entire senior year he would let me drive to and from work and school. This is the car that my Dad taught me to drive in. 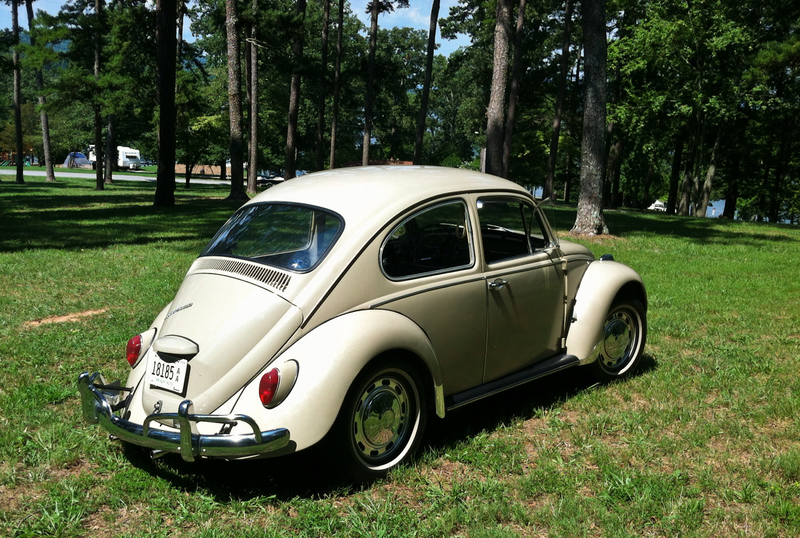 My wife Stephanie also drove a beetle to school – a ’66 off-white sun roof. She too learned to drive in her ’66 VW. After I graduated high school in ’82, I went into the United States Air Force, Dad took possession back of the ’71 green beetle and sold it and by the time I came home from basic training. I was bitten by the “bug” again and was soon looking for another VW beetle. I sold a motorcycle (so glad I did that) and used the money to scour Fayetteville, North Carolina where I was stationed. I found a ’66 sea foam green VW beetle and paid $450 for it. This was my daily driver for 8 years and was a slow project car – nickel and dime replacement parts here and there. An interesting story with my ’66 bug was when my wife and I were driving it home from Chattanooga, TN to Fayetteville, NC. In the pouring rain, our already extremely slow 6 volt windshield wiper motor “died”. We had seen on TV that potatoes have basically the same water repelling properties as “Rain-X”. Around Atlanta we stopped and bought a handful of potatoes. For the next 400 miles while driving down the interstate in the pouring rain, we would lean out our windows every 20 minutes and wipe the windshield with a fresh slice of potato so we could see (and yes – it really works). 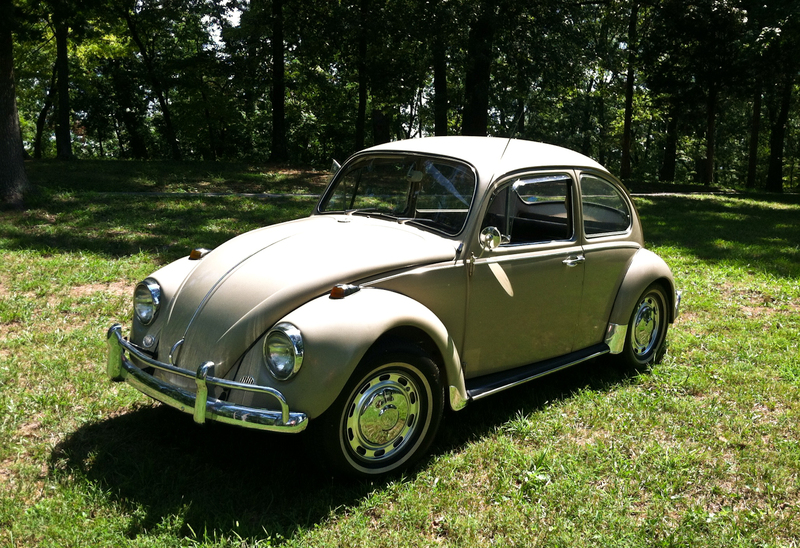 When I was leaving the Air Force in ’92 I sold the ’66 bug because I didn’t want the hassle of dragging a spare car all the way home to Chattanooga, TN. For 20 years I regretted selling the ’66 beetle. I had a spot in my heart for another VW beetle and since my wife too was a VW person convincing her that it was time to start seriously looking for another VW beetle was not hard to do. We both have fond memories of riding around together as teenagers in our VW beetles. I started seriously looking on Craig’s list for a VW – anything before a ’72 but preferably something before ’68 was in my sights. She and I took a few road trips to check out a few VW beetle ads only to be disappointed in what we saw when we got there. We even drove from Chattanooga, TN, Atlanta, and Macon, GA; spent the night in a hotel to see a brown ’66 beetle the next morning – only to again be let down and to drive all the way back home – “beetle-less”. I kept looking on Craig’s list and spotted this beautiful ’67 Savannah beige beetle – I called the owner about the car/price but she was unwilling to budge on the price which I thought was a little steep. Now looking back I realize, a 45 year old VW beetle not needing a restoration job at all and probably 90 percent original in extremely good condition – the price was very reasonable. We drove about 50 miles to go see the car – and when we saw it, the “chemistry” began to happen- then we sat in it and it was like stepping back in time – the VW “smell” was there along with the interior and exterior that was completely unmolested and in excellent condition down to the Sapphire V AM radio. I fell in love with it. I made her an offer, she accepted and we drove it home mid May 2012. It now sits garaged and babied and it is by far my most favorite vehicle I’ve ever owned. What makes the ’67 beetle unique is several things. It was the last year that VW retained that “classic” look – meaning the last year with the old style chrome bumpers. It was also the last year you had to “pop” the trunk open to pump gas into it which is always an eye catcher at the gas stations- people are intrigued by this bit of nostalgia. Also the first year with a 12 volt system. In my opinion, they upgraded the car in ’67 without destroying the look or the feel. Great story, especially the part about the potatoes. Agreed. Kevin is a great guy with a classic ’67. Thanks guys! it is a great car- I feel lucky and fortunate to have found it. I probably will hang onto it- I learned my lesson with the 1966. My first car was the 67 Savannah Beige. Loved that car, but it met up with a tractor trailer and became a dune buggy, somewhere in Texas. But, I do have a replacement, the 67, but in the L639 Zenith Blue. Will get pics of it soon.